A new airfield pavement maintenance program. A statewide general aviation airport project aims to maximize the lifespan of asphalt pavements by developing a rotational maintenance schedule for 75 airports. The completion of a 16-year highway improvement project. Highway 65 in northwest Arkansas, a high-priority corridor, now carries traffic on 18 miles of realigned roadway. Why experienced bridge inspectors and structural engineers are needed to evaluate and rehabilitate our nation’s aging bridges. 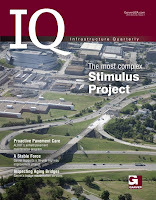 Watch your mailbox for IQ (Volume 2, Issue 1) or read it online along with past issues at http://www.garverusa.com/.